This lively introduction to heterodox economics provides a balanced critique of the standard introductory macroeconomic curriculum. In clear and accessible prose, it explains many of the key principles that underlie a variety of alternative theoretical perspectives (including institutionalist economics, radical economics, Post Keynesian economics, feminist economics, ecological economics, Marxist economics, social economics, and socioeconomics). 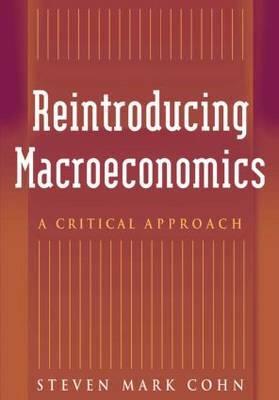 Because the book's structure parallels the chapters and subject matter presented in a typical introductory macroeconomics textbook, "Reintroducing Macroeconomics" provides readers with a running commentary on the standard approach, while simultaneously introducing them to a broader range of ideas about the causes and appropriate policy responses to a wide range of common economic problems. Although designed primarily as a companion volume for students in introductory economics courses, the book can also be used effectively for more targeted applications that highlight a particular economic issue or approach. It will be of particular interest to students in related disciplines (such as American Studies, anthropology, black studies, environmental studies, gender studies, history, political science, and sociology) who may be required to take introductory economics classes and who are interested in gaining an alternative perspective. By demonstrating the vitality and common ground underlying a broad spectrum of heterodox approaches, "Reintroducing Macroeconomics" brings alternative perspectives into the classroom in an accessible way that empowers students to think about the economy in new and exciting ways. The text includes end-of-chapter study questions, as well as a detailed note to instructors.